In 2004, Brock Lesnar left the WWE to pursue other endeavors. After a brief stint making a run at the NFL, Lesnar ended up beginning his career in MMA, landing in the UFC in 2008 and winning the heavyweight title at the end of that year. But a prolonged battle with diverticulitis cut Lesnar’s MMA career short and he retired from the sport in 2011. Then, a little less than a year ago, Brock Lesnar returned to MMA after an almost five-year hiatus, winning a unanimous decision over Mark Hunt at UFC 200. It was billed as a “one-off” special event but Lesnar’s victory engendered hopes of a sustained return to the sport. Those dreams were short-lived though when Lesnar was flagged by USADA for an anti-doping violation shortly after UFC 200. The end result was Lesnar’s win being overturned to a no-contest and a one-year suspension for the MMA and wrestling superstar. In light of this, Lesnar once again retired from MMA to focus on professional wrestling. But don’t count Lesnar out just yet. According to Lesnar’s close friend and on screen wrestling “advocate” Paul Heyman, Lesnar may well return to MMA one day to satisfy his competitive urges. 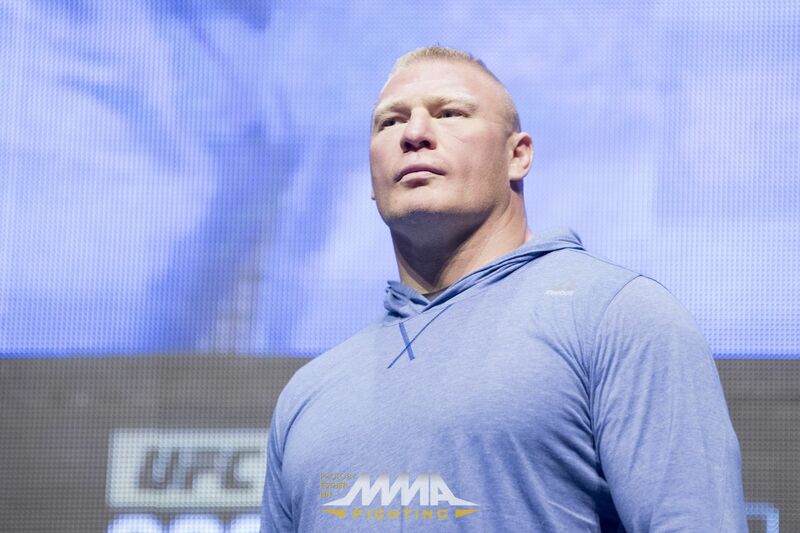 “Brock is, in his heart, a trained competitor,” Heyman recently told the Fight Society podcast. “Now whether that means he’s going to look at this environment and say ‘You know what, I didn’t make the Vikings team in 2004 but I bet in 2017 I can and just because I can I’m going to just to show people that I want to and I take it’. Because when we named him the conqueror, that’s what he is. He’s a legit conqueror. You put a task before him and he conquers it. Heyman also said he sees that same competitive spirit in UFC lightweight champion Conor McGregor. McGregor is attempting to disprove the doubters by knocking out Floyd Mayweather in a boxing match, a task most view as even more unlikely than anything Lesnar has ever accomplished. But Heyman says that the for guys like Lesnar and McGregor, the impossibility of a task is what motivates them. As for Lesnar’s next impossible task? Heyman says he doesn’t know what it will be but you shouldn’t bet against him coming back. Lesnar’s USADA suspension ends in July of this year and after winning the WWE title at Wrestlemania yesterday, it’s possible he’ll have his eyes set on reclaiming another championship belt in the future. Never started. Thiago Alves says he’s done with fighting at lightweight. Weirdo. Jimi Manuwa still wants a fight with “weirdo” David Haye. Delusions of grandeur. Dillon Danis believes Conor McGregor knocks out Floyd Mayweather within five rounds. Confidence. Wilson Reis is willing to give Demetrious Johnson an immediate rematch after beating him. Retired. Dan Henderson says he has no desire to come out of retirement. USADA. Lyman Good receives a six month USADA suspension for tainted vitamin. Some McGregor content for y’all. Fun scrap from the weekend. April Fool’s Day is the worst. Finally the news is confirmed. Conor v Mayweather. Let’s do this! Slightly unusual rule set. Me and conor v him and his dad. Hell in a Cell, no holds barred. My prediction? PAIN. Nice to see Ali at least doing the trash talk on his own account. Savage knee from the weekend. Nate and Pride veteran/Combate Americas president. @PaddyTheBaddy Keep your head high, haters will always be there, waiting on your downfall, enjoy your time off and go back to work!! Damir Hadzovic (10-3) vs. Marcin Held (22-6); UFC Fight Night: Stockholm, May 28. 2005: Fedor Emelianenko avenged the only loss of his career (at that point), stopping Tsuyoshi Kosaka at Pride Bushido 6. 2009: Bellator MMA held their first ever event which featured Eddie Alvarez submitting Greg Loughran with a guillotine choke in the first round of their lightweight tournament. Alvarez would go on to win that title and become the face of the organization. Finally. We finally have another UFC fight week, and this one is actually a good one. This year has been entirely bereft of big cards, and while UFC 210 isn’t some kind of juggernaut, it does at least have a legitimate big fight to top it off. Feels like forever since we’ve had that. That’s all for today, folks. Conor bless and see y’all tomorrow.